I hope you never get tired of all these busy bag games, because I am crazy about them! 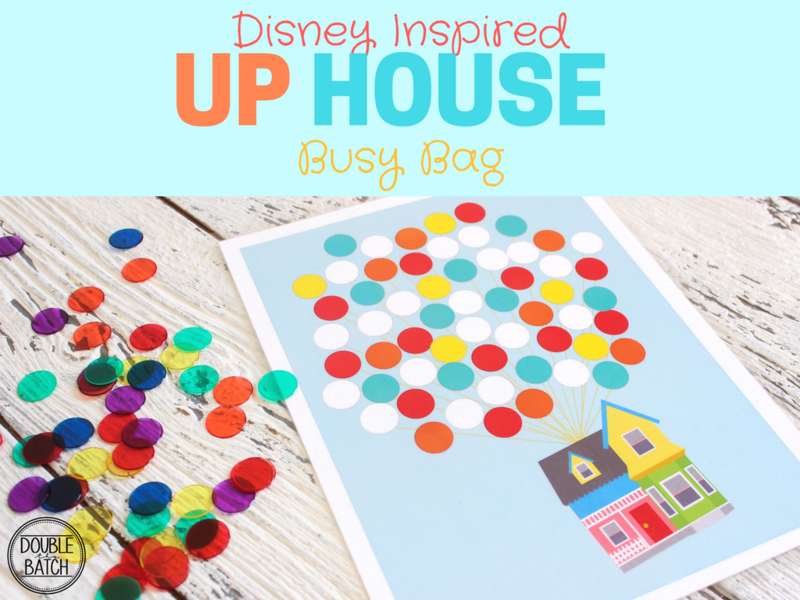 Here’s another Disney Inspired Busy Bag game. 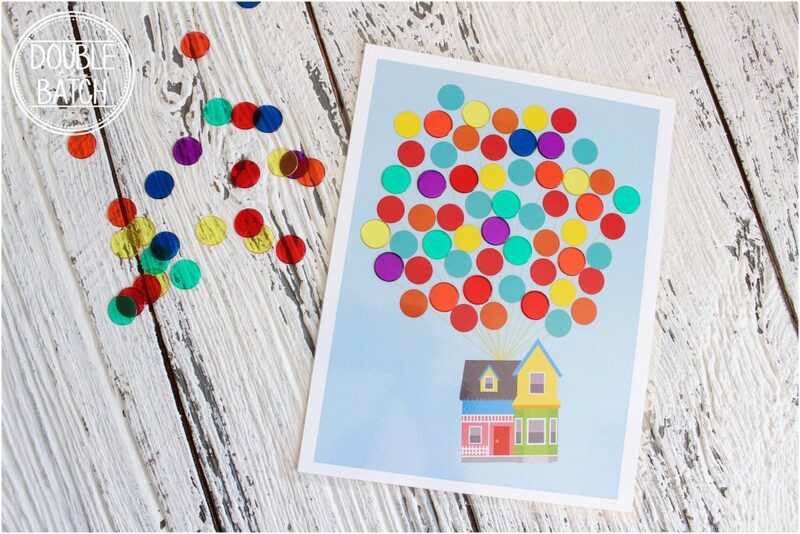 I hope you recognize this colorful house and the bright-colored balloons from the Disney’s “UP”. I got some of these transparent colored counting chips and my son dumped them onto counter covering a stack of white paper. While helping him to clean up all 250 pieces, I immediately thought they looked like colorful balloons. So, there you have it- the UP HOUSE INSPIRED BUSY BAG was born. Thanks to my son and his “Oops” moment. There is always a bright side my friends! 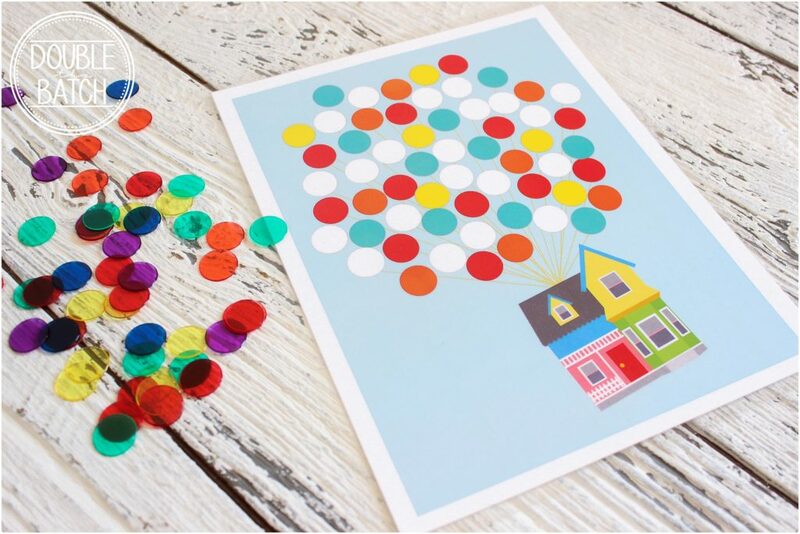 This fun game teaches hand-eye coordination, counting, shapes, and color names. Simply cover the white balloons with the colored counters to make a bouquet of colorful balloons. When I play any game with my little kiddos, I ask dozens of questions. What color is the door? How many yellow balloons do you see? What shape is the window? What is your favorite colored balloon? You can even have them match the balloon colors to parts of the house! The kids just think it’s a game, but I see every game as a tool for learning. Put those little minds to work. They will blow you away! Test them and stretch those little brains. Here is another option for playing without the counting chips. Use round color coding stickers. They are just the right size and you can find them just about everywhere. They won’t fall off the page but still teach coordination, shapes, and colors, and we know all kids love stickers! Make sure to laminate your sheets so you can peel off the stickers and play again. Check out some other awesome busy bag ideas here!